Cheap Biofinity Energys contact lenses, designed for digital life. 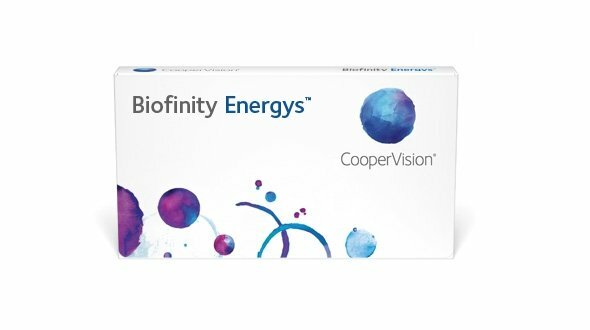 Biofinity Energys is a state-of-the-art contact lens , recently designed by Coopervision laboratories to help patients with tired and dry eyes, associated with the use of electronic or digital devices. Fatigue and dry eyes are very common symptoms in digital visual fatigue. It is a process of exhaustion or tiredness of the eye and the visual system due to the abuse of vision at close distances, exhausting the ciliary muscles of the eyes and producing associated symptoms such as tiredness, headache, eye dry, red eyes and inability to continue the task. At the same time, it is important to mention that when a computer, tablets, mobile phones are used excessively ... the flicker frequency is reduced while looking at the screen, resulting in changes in the tear film and consequently dry eyes. If we are contact lens wearers daily and suffer from dry eyes and eyestrain, it would be convenient to switch to Energys contact lenses . Optical design: it is based on a special carving in which the anterior face has several curves used in the optical zone. These curves distribute the power evenly simulating a more positive power in the central area of ​​the lens, helping the accommodative effort, without penalizing the far vision. Its adaptation is like any other contact lens. Lens material: it uses its Aquaform technology, for a natural oxygenation and moisturization of the eye. Aquaform technology attracts and retains water molecules, even in low-flicker situations. Its long silicone chains ensure the passage of oxygen to the eye, keeping it white and healthy. Powers: Correct myopia up to -12.00 diopters and hyperopia until +8.00 diopters. Optical design: Digital Zone Optics. The use of these lenses is daily with monthly replacement, the month of use is thrown away. They can also be left to sleep with them for 29 nights in a row. To this day, Biofinity Energys is not going to be marketed under another name, that is, it is not customized for groups or optical chains, if you have doubts about the contact lenses you are using or would like to change to this contact lens, consult with our professionals, they will advise you and help you carry it out. In Prodevisión, online optics, you can buy Biofinity Energys cheap lenses, the only lenses designed for digital life.